Magda Gerber is one of Our Neighborhood’s favorite authors and she is the founder of RIE, Resources for Infant Educarers. In the book “Your Self-Confident Baby”, Magda provides basic principles for families as they start to explore and develop their parenting style. We have found Baby Knows Best our favorite RIE resource because it is modern, easy to read, and well organized. 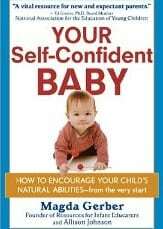 “Your Self-Confident Baby” can be another outlet to deepen your understanding of RIE through the words of its founder. I enjoy that “Your Self-Confident Baby” draws attention to how caregivers can unintentionally undermine children’s self-confidence. Throughout the book, Magda shares wisdom from working with generations of children and families. Infants are people with all the same basic human needs as adults. You don’t have to be perfect, just be reflective. Starting to show that it is a bit dated.